Now in the depths of spring, we at the Nebraska League of Conservation Voters have had a busy season thus far. 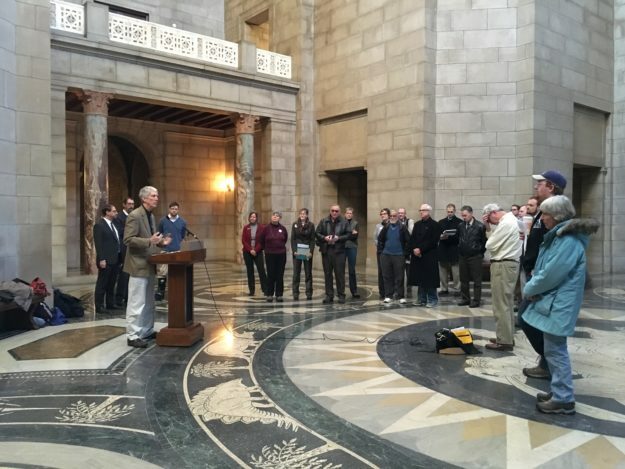 From bringing together over 150 Nebraskans to hear from world-renowned nature photographer, David Thoreson, in May to lobbying on Capitol Hill for sound conservation policies last weekend, we’re excited about the energy surrounding the conservation of our state’s beautiful natural resources. 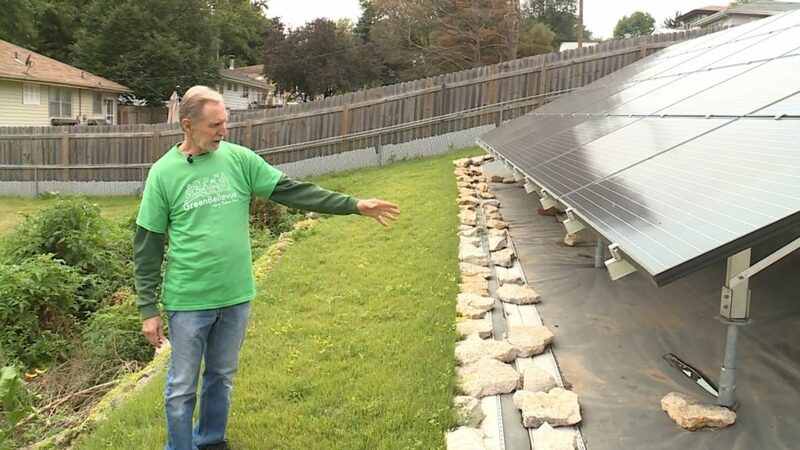 NCEF Common Ground organizers have been working hard to bring solar energy education to various communities in the Northeast region of the state. Check out this write-up about NCEF’s solar presentation from the Columbus Telegram, and take a look through these photos from the group’s tour of the Fremont Community Solar Farm and the Lon D. Wright Power Plant. Learn more about Common Ground’s local events at our Facebook page. Join NCEF for this event, which will include discussion about community development, citizen involvement, and renewable energy in Northeast Nebraska. This event is free and open to the public, but please register here if you plan to attend. 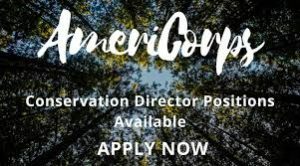 We are hiring Common Ground AmeriCorps members, who will serve from September 1, 2018 to August 31st, 2019. As an AmeriCorps Member with the Nebraska Conservation Education Fund (NCEF), you will increase knowledge of and concern for the most important conservation issues facing our state through our Nebraska-wide Common Ground Program. You will recruit, coach, and support local community volunteers in implementing conservation projects, and build partnerships between conservation professionals, local and state government, and your fellow community members. Apply here to join our team of organizers that provide conservation education and outreach to every corner of our state. 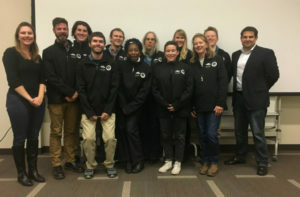 Benefits of being an AmeriCorps member include a living stipend, education award, and joining a prestigious, nationwide group of people who are committed to giving back to their communities. Positions are available in Lincoln, Omaha, York, Grand Island, North Platte, and Scottsbluff. Applications will be accepted on a rolling basis until July 1 or until all positions are filled. To subscribe to NLCVs electronic newsletters sign up here. 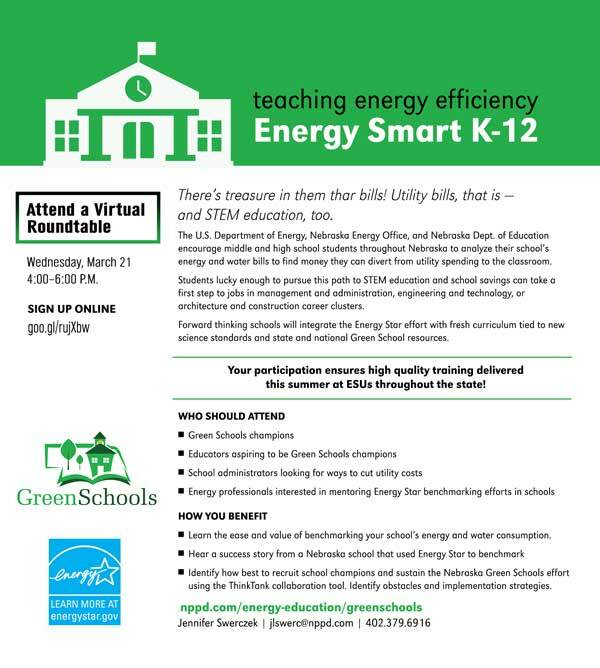 This entry was posted in Community Partners, Nebraska / Midwest News, Solar Energy Education and tagged allied organizations, Chelsea Johnson - NLCV Deputy Director, NCEF Common Ground, Nebraska Conservation Education Fund, Nebraska League of Conservation Voters on June 14, 2018 by Helen Deffenbacher. Many thanks to our Green Watts for Good supporters during Omaha Gives! Forty-two contributors generously donated $3,172 to our Green Watts for Good Fundraising Campaign! At midnight that put us halfway to our goal of raising sufficient funds for a second 4-kilowatt (4000 watts) photovoltaic (PV) system! A generous donation today of $1,000 from the Nebraska Solar Energy Society brings the total amount raised toward the second PV system to $4,172! NFS also has received pledges from two Nebraska solar energy businesses to donate solar panels for Green Watts for Good projects! We will use all Green Watts for Good donations to date to leverage matching contributions from local foundations, businesses and individual philanthropists. 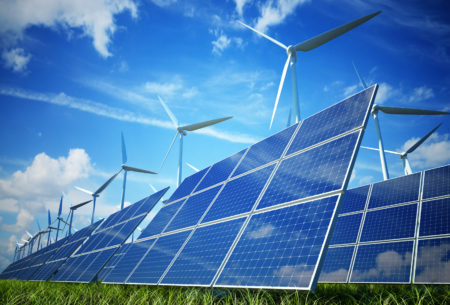 We will also work with our partnering nonprofit to finalize plans to install the first 4-kilowatt photovoltaic (PV) system on an Omaha home using the generous donation to our Green Watts for Good Fund made by two local philanthropists on Earth Day. Organize a “barn-raising” type effort to install the PV system. 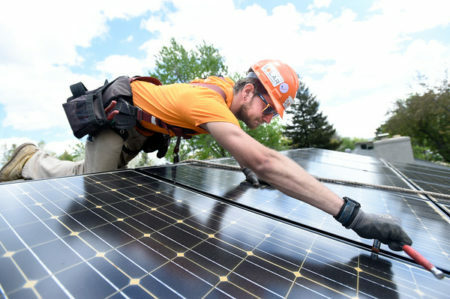 NFS board members, who include three solar professionals and four with rooftop solar, and other volunteers will “raise” the solar panels, which come with a manufacturer’s warranty to last 25 years. 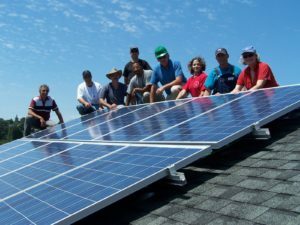 Nebraskans for Solar is an all-volunteer nonprofit, and so 100% of all donations go to support our Green Watts for Good Initiative. Our long-term goal is to create a revolving loan fund to enable homeowners to purchase PV systems and to save money over many years. Photo: Washington State Habitat for Humanity volunteers celebrating a job well done. 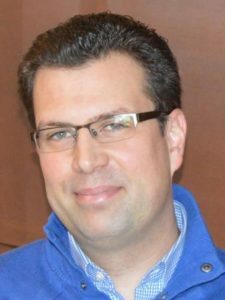 This entry was posted in Community Partners, Financing, Nebraska / Midwest News and tagged Nebraskans for Solar, Nebraskans for Solar's New Green Watts for Good Initiative, Omaha Gives 2018 on May 24, 2018 by Helen Deffenbacher. 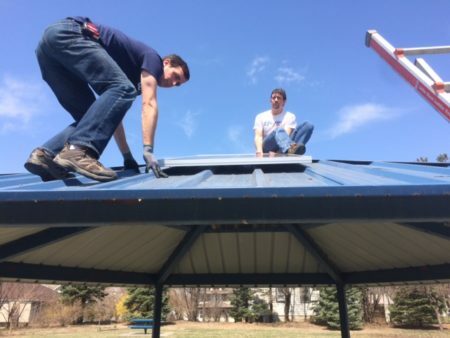 On Earth Day, Sunday April 22, at 1p.m., the Joslyn Castle Neighborhood Association, in partnership with Nebraskans for Solar, will celebrate the installation of solar panels in Clarkson Park, located at 124 North 42nd Street. Clarkson Park will be the first Omaha city park to be equipped with solar panels providing electrical power to an outlet and charging station. 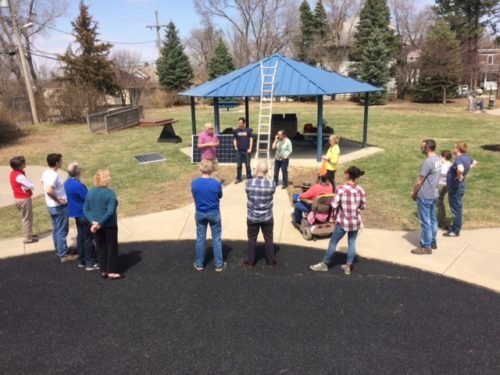 Funding for this project was provided by the 2017 Mayor Neighborhood Grant to provide a reliable source of power in the park for neighborhood-sponsored events. By bringing clean, reliable power to Clarkson Park, the community will be able to schedule more events and activities, such as movie nights, food festivals, and other activities that require a power source. In addition, this project could be a pilot project for other, larger city parks that need power. Solar panels could be a future cost savings, taking the burden off the city’s electrical grid, and helping Omaha move towards more sustainable green energy. This entry was posted in Community Partners, Nebraska / Midwest News and tagged Clarkson Park, Joslyn Castle Neighborhood Association, Margie Magnuson - Joslyn Castle Neighborhood Association, Nebraskans for Soar, Omaha neighborhood associations on April 18, 2018 by Helen Deffenbacher. Nebraskans for Solar board members wish to thank our distinguished guest speaker for Earth Month 2018, Dr. Bing Chen, for his excellent and well-received presentation last evening at UNO’s Community Engagement Center. Dr. Chen is Professor of Electrical Engineering, UNL, and Passive Solar Research Group (PSRG) Director. His discussion focused on PSRG’s current research project and the application of passive solar features to a demonstration assisted living unit (ALU) utilizing renewable energy, which the group has dubbed “Small House on the Prairie.” Dr. Chen also addressed steps audience members can take to conserve energy in their own homes, from the less-expensive to more comprehensive passive solar retrofits. 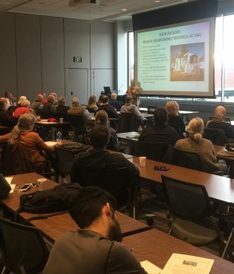 This entry was posted in Community Partners, Nebraska / Midwest News, Solar Energy Education and tagged alternative housing solutions for America's elders, Dr. Bing Chen, innovative assisted living units (ALU), Nebraskans for Solar's ongoing series of educational public forums, passive solar energy, Passive Solar Research Group, Small House on the Prairie on April 18, 2018 by Helen Deffenbacher.